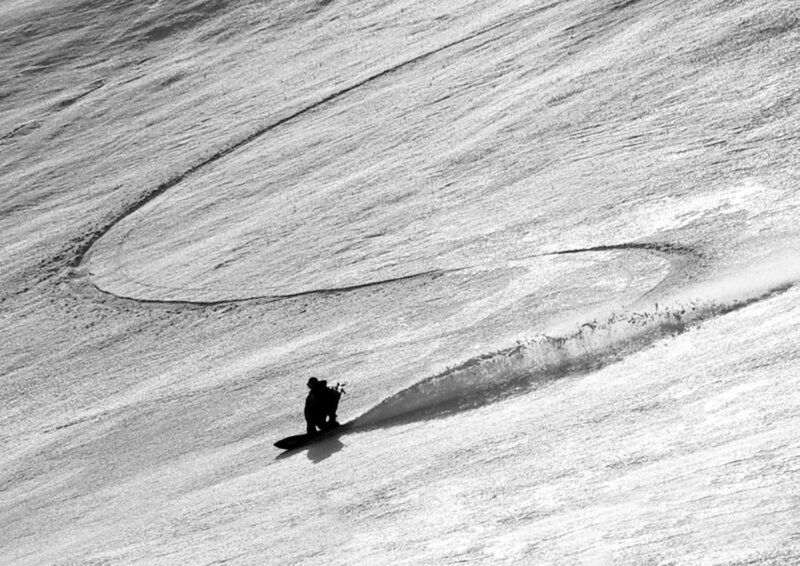 Everything you know and love about snowboarding began with a surfer. More than forty years ago, Moss founder Shinzo Tanuma had a dream to surf on snow. In 1971, he created the first Moss Snowstick prototype, which was made from urethane foam and fiberglass, much like a traditional surfboard. He test-rode the prototype at the Akakura Onsen ski resort in Niigata, Japan, and there began the story of the world's oldest snowsurfing maker. How can a person surf on snow? It was the passionate, single-minded pursuit of that answer that drove Shinzo’s initial research and development. What he sought after was a feel unlike skiing—a turning sensation that until then could only be experienced on a surfboard. The first snowboards went on sale under the Moss Snowstick name in 1979 and featured the first ever fixed hard bindings. Developed from the release plates used on skis and designed for use with ski boots, our innovative designs ushered snowsurfing to the next level to achieve the more precise carving sought out by our founders. To further promote the spread of snowsurfing, we established the Japan Snow Surfing Association in 1982, and hosted the first snowsurfing championships at Ludens Showa ski resort in Niigata the following year. Through the Association, we continued to launch tournaments including the Marui Snow Surfing Grand Prix, giving rise to athletes like Taro Tamai of Gentemstick. In 1984, the progenitor of the Moss Snowstick signature U series launched. Called the V-1 series, the boards featured a layered fiberglass core and fluorine resin coating with cracked steel edges. In the mid 1980's, with the establishment of the North American Snowboard Association came a pronounced shift as “snowboarding” became the primary term encompassing both snowboarding and snowsurfing. International snowboarding competitions grew in popularity across Europe and North America, and snowboarding secured its position as a major sport. Meanwhile, snowsurfing stepped out of the limelight, but continued to develop a cult following in search of adventure in the snowy backcountry. In the new snowboarding era, in 1988, we shifted production and launched the 1800SL model snowboard, which was based on the construction method of skis. The following year, with the release of the alpine and freestyle models, Moss Snowboards was born and we had officially entered the snowboarding scene. Moss continues to test and innovate to further refine the turning sensations and styles that make our high-performance boards unique. Our biggest assets are our technical expertise and craftsmanship—products of over forty years of passion and dedication. In 2007, Shinzo Tanuma recognized that the time had come to re-introduce Moss Snowstick to the world. His mission is simple and has remained unchanged since 1971: to share the pure passion and joy of surfing on snow.